For September, the average contiguous U.S. temperature was 67.8°F, 2.9°F above the 20th century average. Record warm conditions were observed for parts of the Southwest, Southeast, Midwest and Mid-Atlantic with near- to below-average temperatures across parts of the Northwest and Great Plains. 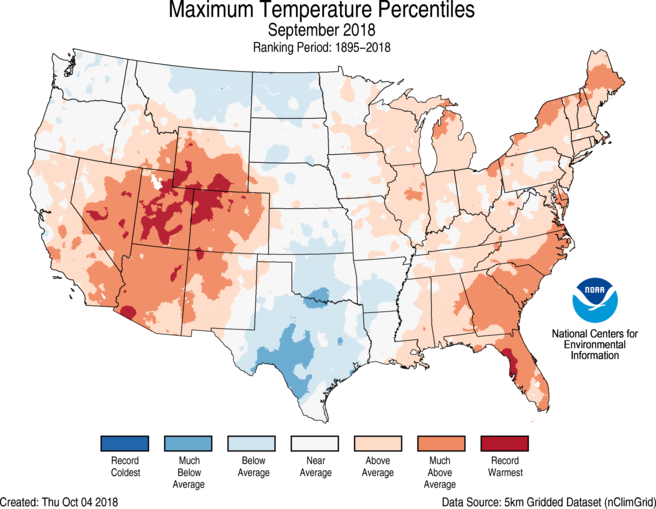 For the year-to-date, the contiguous U.S. temperature was 57.0°F, 2.0°F above the 20th century average, the eighth warmest January-September on record. The September precipitation total for the contiguous U.S. was 3.49 inches, 1.00 inch above average, and marked the third wettest September in the 124-year period of record. Tropical systems fueled record-setting precipitation across parts of the eastern U.S. Hurricane Florence made landfall near Wrightsville Beach, North Carolina, bringing torrential rainfall, prolonged storm surge and record flooding to the Carolinas. For the year-to-date, the national precipitation total was 25.20 inches, 2.00 inches above average, the 13th wettest January-September on record. NCEI has updated the 2018 billion-dollar weather and climate disaster list to include five additional events – Hurricane Florence, the Western wildfires, the Southwest/Southern Plains drought, a mid-June Colorado hail storm and a mid-April southern and eastern tornadoes and severe weather event. This brings the year-to-date total to 11 weather and climate disaster events with losses exceeding $1 billion each across the U.S. Above-average September temperatures were observed across the Southwest and from the Mississippi River to East Coast. 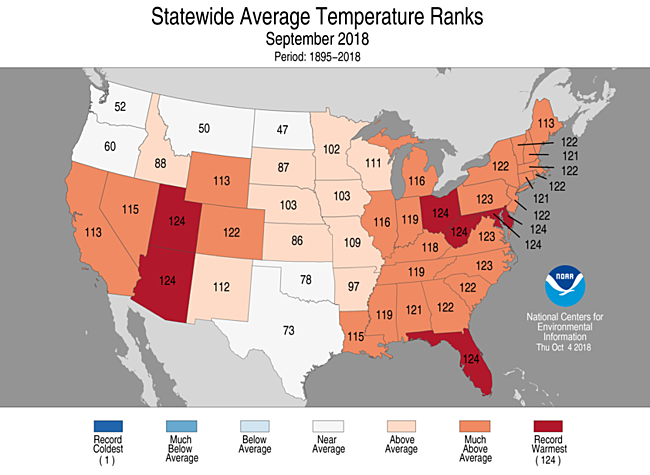 Seven states – Arizona, Delaware, Florida, Maryland, Ohio, Utah and West Virginia – each had a record warm September with 22 additional states having a top 10 warm month. Near- to below-average conditions were present for parts of the Northwest, Northern Plains and Southern Plains. The nationally averaged minimum temperature, or overnight low, was particularly warm at 4.0°F above average, the second highest September value on record. 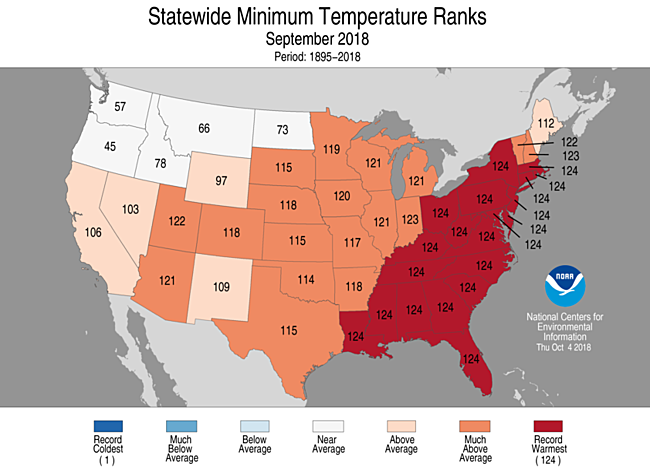 Twenty states across the East had record warm September minimum temperatures. Conversely, maximum temperatures, or afternoon highs, were below-average for parts of the Great Plains. Texas had its coolest September maximum temperatures since 2009. Alaska tied its fourth warmest September on record with a statewide average temperature of 44.3°F, 3.7°F above the long-term average. This was the warmest September for the state since 2006. Record warmth was observed for western and southern parts of Alaska with near-average conditions for northern regions and parts of the Panhandle. Anchorage, Bethel and Kotzebue each had their warmest September on record. 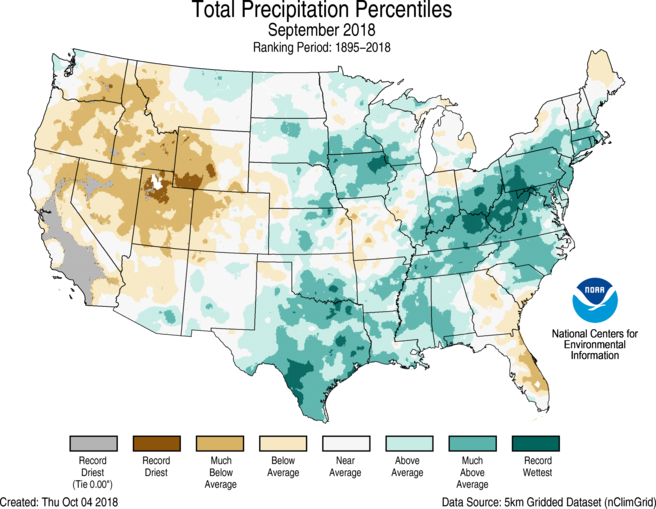 Above-average precipitation was observed for many locations from the Great Plains to the East Coast where several storm systems of tropical origin, including Tropical Storm Gordon and Hurricane Florence, caused heavy rainfall. Record precipitation fell in parts of the Southern Plains, Midwest and Ohio Valley. Texas and West Virginia each had their wettest September on record with 14 additional states having a top 10 wet month. Hurricane Florence made landfall near Wrightsville Beach, North Carolina, on September 14 as a Category 1 hurricane with wind gusts observed as high as 105 mph. The storm moved slowly, in an unprecedented path, nearly parallel to the Carolina coastline for about a day, before moving inland. It caused prolonged storm surge to coastal areas, torrential rainfall* stretching far inland and spawned over 30 tornadoes. As the storm moved inland, many rivers in eastern parts of the Carolinas reached record or near-record high crests days after the storm moved through, prolonging the disaster. As Florence weakened inland, it interacted with a cold front and brought heavy rainfall to the Mid-Atlantic and Northeast. At least 51 fatalities were attributed to Florence, and once the final calculation of damages is completed, the storm is expected to be one of the deadliest and costliest to ever impact the Carolinas. Below-average precipitation stretched from the West Coast to the Rockies with record low precipitation totals for parts of California, Utah and Wyoming. For only the fifth time since reliable records began in 1874, Salt Lake City, Utah, received just a trace amount of rainfall during September. On the statewide level, California, Idaho, Nevada and Utah each had a top 10 dry month. Alaska had its third driest September on record, with 2.52 inches of precipitation, 2.05 inches below average. Western and southern areas of Alaska received below-average precipitation with record dry conditions for the Panhandle. Juneau, Cordova and Sitka had their driest September on record. The warm and dry month contributed to little or no snow for some low-elevation, interior locations of the state, and Bettles had its first snow-free September since 1997. Olivia made landfall on Maui and Lanai in Hawaii on September 12 as a tropical storm, bringing more than a foot of rain to some locations with observed winds over 50 mph. This was the first tropical cyclone to make landfall on either Maui or Lanai since modern records began. The biggest impact from the storm was flash flooding on parts of Maui and Oahu. According to the October 2 U.S. Drought Monitor report, 29.0 percent of the contiguous U.S. was in drought, down from 34.4 percent at the end of August. Drought conditions improved across the Central and Southern Plains, the Mississippi River Valley, and parts of the Southwest, Midwest and Northeast. Drought conditions expanded and intensified across the Northwest, Central Rockies, Northern Plains and parts of the Southeast. Abnormal dryness expanded in the Alaskan Panhandle. Above-average year-to-date temperatures were observed for much of the nation with record warmth in the Southwest. Arizona and New Mexico each had their warmest January-September on record. Near- to below-average temperatures were observed in the Northern Plains. Afternoon high temperatures were particularly cooler than average for the Northern Plains. Above-average January-September precipitation stretched across the Northern Plains, Upper Midwest and from the Deep South to Mid-Atlantic and Northeast. Maryland, Pennsylvania and West Virginia each had their wettest year-to-date on record. Below-average precipitation fell across parts of the West, where Colorado had its eighth driest year-to-date on record. *Note on Hurricane Florence precipitation: As is typical with very heavy rainfall events, localized bands of very heavy rain may not be completely captured by the gauge-based observing network, the basis of this analysis. This can lead to an underrepresentation of actual rainfall totals. This can be compounded by disruptions to the observers' ability to report values during or following a severe event and several of our long-term reporting stations have missing data for this event. Additionally, in order to ensure a proper climatological context, a 10-year period of record is required for a reporting station to be included in these monthly analyses. Some of the values reported during this event came from stations that do not have a sufficiently long period of record to meet that requirement. The complete U.S. climate report for September 2018 will be available on Monday, October 15. According to the September 19 U.S. Drought Monitor, moderate to extreme drought covers 15.5% of the contiguous U.S.
During September, the average contiguous U.S. temperature was 66.3°F, 1.4°F above average.